Made from steel drums by Haitian craftspeople in the section of Port-au-Prince, Haiti called Croix des Bouquets, this sun is three dimensional with a diameter of 10 inches. It has a small hook to hang the piece and is sponge painted with bright colors inspired by the local Haitian culture. This 11-inch nativity in the stars is handmade in Haiti from scrap steel drums and hand painted. This piece is 11 inches in diameter. This piece of Haitian metal wall art is 24 inches in diameter. It features an angel on the moon, hand-cut, embossed and painted. This 24 inch Haitian metal wall art features a colorful fish and conch shell. Perfect for hanging indoors or out, the piece is hand painted, hand cut and embossed. 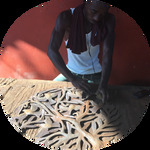 This piece of Haitian metal wall art is 24 inches in diameter. It features a tree of life with geckos, hand-cut, embossed and painted. This 24 inch Haitian metal wall art features a tree of life with birds in a heart shape. Perfect for hanging indoors or out, the piece is hand painted, hand cut and embossed. This piece of Haitian metal wall art is 24 inches in diameter. It features two large fish jumping, hand-cut, embossed and painted. Featuring angels on a bicycle, this 24-inch diameter piece of wall art is hand painted, cut and embossed from metal oil drums. The sealed finish makes this piece perfect for hanging indoors or out. Handcrafted from steel oil drums, this piece features an inspirational message. It is 17 * 16 inches. Suitable for indoor or outdoor use.